Sometimes I have to take a step back and remind myself that I have only been a mother for six months. Since Eric arrived time has just flown by in an excited whirlwind and it only seems like yesterday I was bouncing on my birthing ball willing myself into labour. Although my little Baby Ginger features a lot on my channel, I very rarely talk a lot about him. Naturally my Insta Stories are full of videos, photos and anecdotes that track his day-to-day antics, but as soon as he hit the six month mark I realised it was about time for a proper update. Usually Eric is a good little sleeper. He will go down in between 9 and 10pm and wake up in between 7 and 8am. I change his nappy upstairs, say hello to the baby in the mirror (he loves that game) then bring him downstairs to get him dressed and give him breakfast. He's not quite yet in a structured routine but will go down for 2-3 naps during the day - once in the morning and two in the afternoon. And he is a baby who needs his sleep. He is on the go all the time and if you're not careful it can all get a bit too much and he is an absolute nightmare, not wanting to play, not wanting to sleep, and generally getting himself into a pickle. We do not bath Eric everyday because his skin is really sensetive and susceptible to becoming really dry. So for us, a bedtime routine consists of "pyjama time" at about 7pm, followed by soft lighting, snuggles and a calm atmosphere. He won't go to sleep until about 9-10pm and then he will sleep through (most of the time). Weaning is going really well for us so far. Starting off on purees, we are now starting to introdue more variety, slipping in some finger foods and different textures. I try to stick to a definite breakfast-lunch-dinner routine so that Eric learns when to expect more food and to get him used to three meals a day. I try to do something or take Eric somewhere everyday, always working around his nap times as much as possible. On a Tuesday, Wednesday and Friday we go to a class, and then on Fridays we take a walk down to the canal to feed the ducks. Mondays are a bit crazy as it's usually my time to get the house back to normal after the weekend, catch up on chores, and write. Thursdays are a bit of an odd one because in the afternoon I have my CBT session so we tend to just take it easy so things don't get too rushed. For toys, Baby Ginger loves lights, sounds and books. He will happily enterain himself for a while, and is currently obsessed with rolling around all over the place. His concentration span is increasing and at classes he is starting to get more confident and notice other babies around him. Right from the start we just passed Baby Ginger round to everyone. And now he is perfectly content around family, friends and strangers too. We haven't experienced any clingyness yet (thank goodness) but of course this may change. When it comes to Ryan and I, Eric definitely prefers to cuddle and sit with daddy, or be in the kitchen with him while he cooks, and with me he would rather play. He will look and seek reassurance from me but will only seek out cuddles when he is really tired or upset. I don't mind though - I'm sure the hugs will come in time. 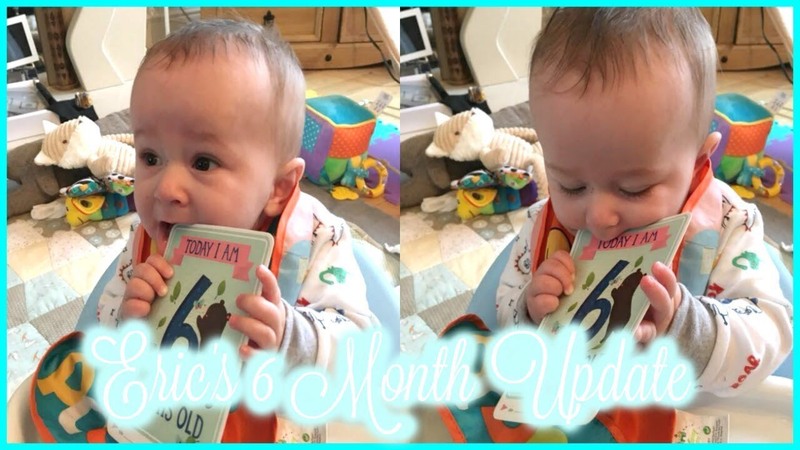 If you want to find out more about Eric - or Baby Ginger - I share a lot more details in his 6 month update video.